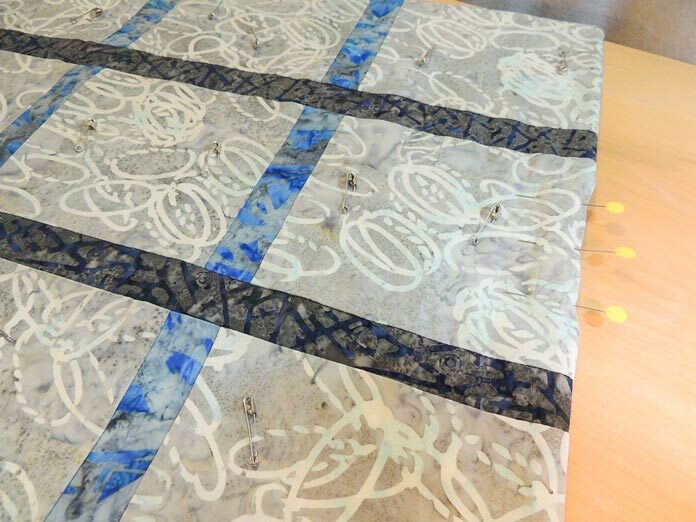 This week has been all about the fun of creating using Banyan Batiks. 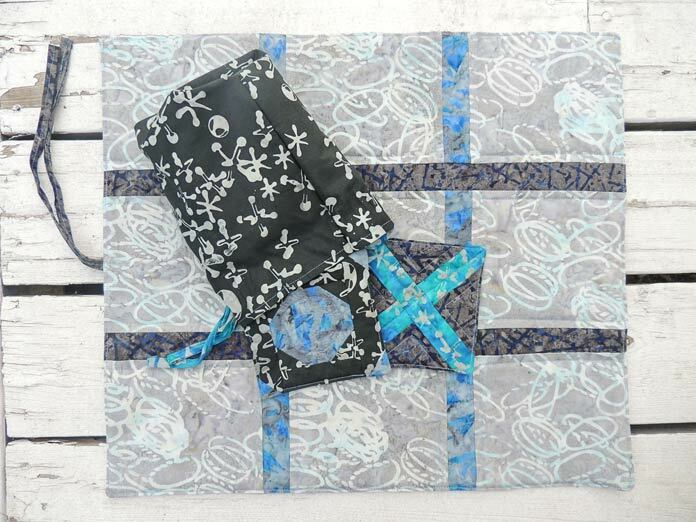 One of the newest lines to be coming to your local fabric store is the Recess fabric line. In yesterday’s post, we made the pieced O blocks to go with our piece X blocks – now all we need is a board to play on! My husband really likes the fabric I picked to use as the background for the quilted game board. 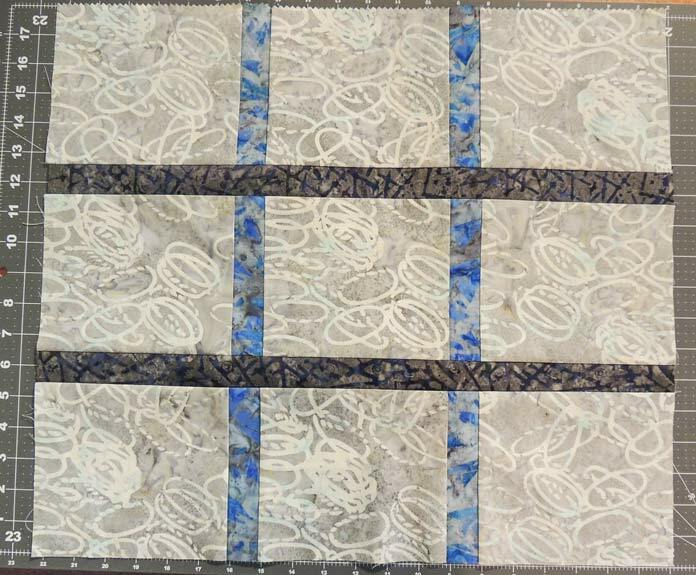 Cut background fabric into 3 – 6½″ x 18″ strips. 1. Sew 1½″ x 18″ Fabric O background strip between two pieces of background fabric; press seams to the background fabric. 2. Sew second background strip to opposite site of Fabric O background strip. 3. Repeat with a second Fabric O background strip to the sewn unit followed by final background strip. Press seams to the background fabric. Layout for adding columns to game board. 4. Cut the unit horizontally into 3 – 5¾″ x 20½″ background units. 5. Sew a 1½″ x 20½″ Fabric O strip between the three units to make the game board. Press the seams to the background units. 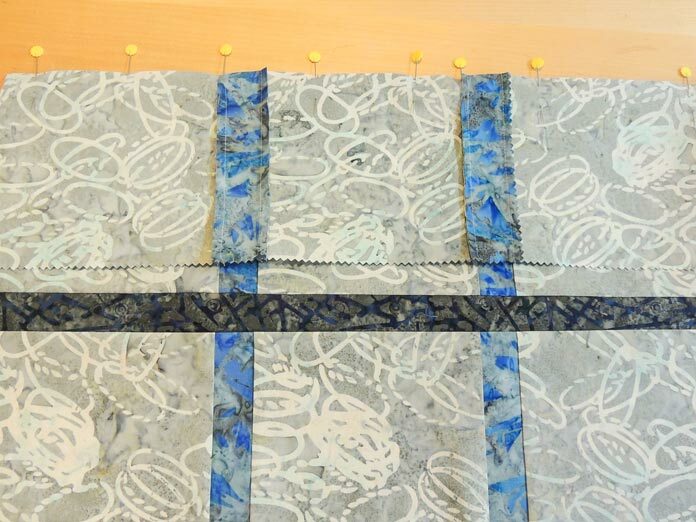 Lining up blue strips and pinning final background row to board. Game board should measure 18″ x 20½″. Trim backing fat quarter to size (18″ x 20½″). Layer batting with backing Right Side Up on top, then the game board Right Side Down. Pin all the way around leaving a 2″ – 3″ turning gap along one short side. 1. 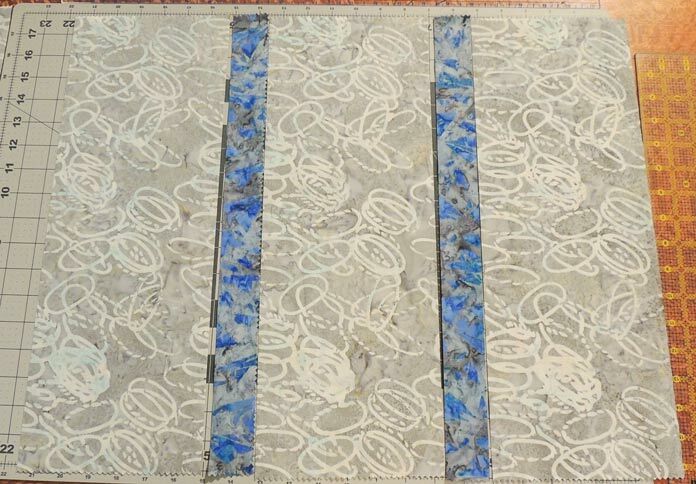 Cut a 1½″ x 20½″ strip of Fabric O background fabric. 2. Lay Right Side Down on ironing surface and press ¼″ over to the back. Repeat on other edges. 3. Press ¼″ over at each end then fold and press the two pressed edges together. 4. Sew one seam down the middle of the tie. 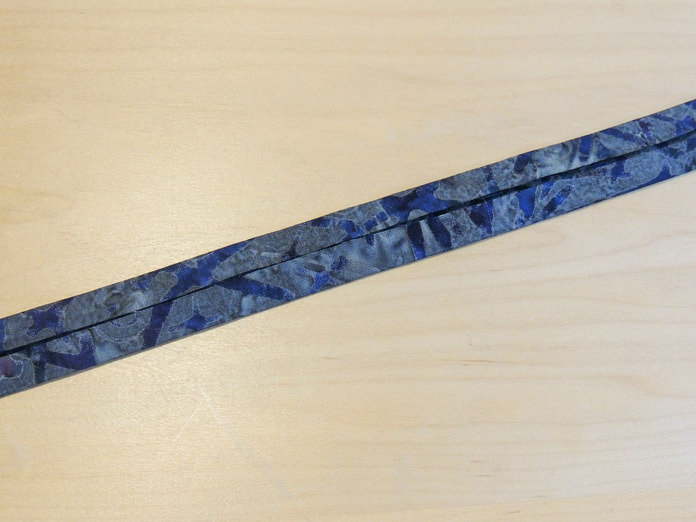 Bend the tie in half and pin the folded end between the backing and game board in the middle of the short side opposite the side with the turning gap. See the photo below. Sew all the way around the game board to sew the layers together, backstitching at each end of the turning gap and over the folded tie end for extra strength. Check that all three layers are secured in the seam all the way around the board, then clip the excess seam allowance at each corner. 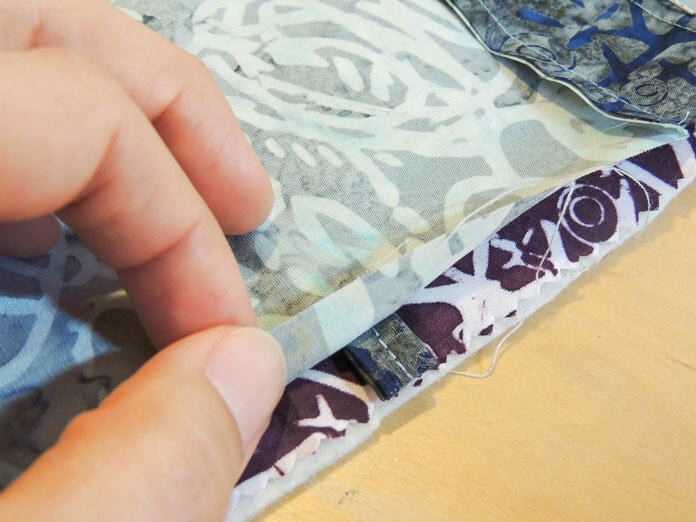 Turn the layers through the turning gap and roll the seams flat with your fingers. Use a tool of your choice to push out the board corners. I put safety pins in at this point through all three layers of the top to keep the layers from shifting before quilting it. 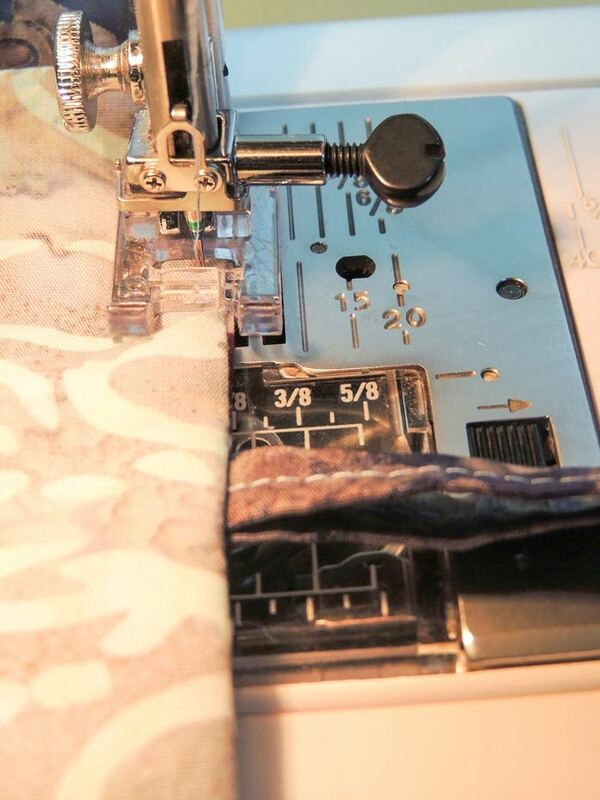 Change to a quilting needle and embroidery presser foot to topstitch around the board. Turning gap pinned and safety pins in the game board. Remember to watch for the tie and keep it on the other side of the needle when topstitching! I stitched ¼″ away from the strips on the board. 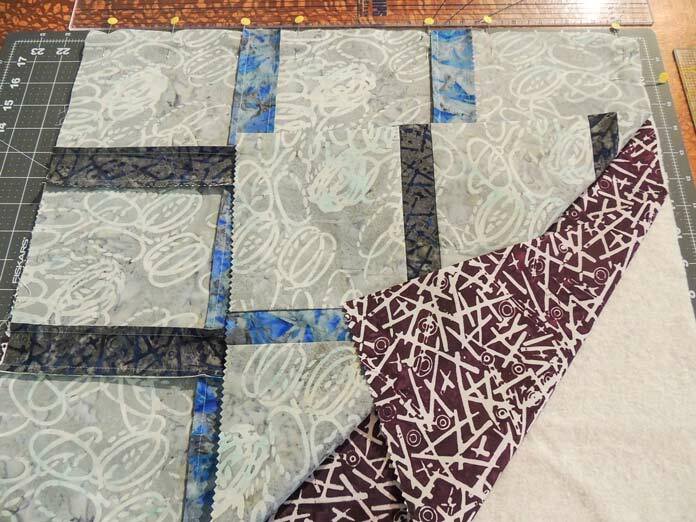 You can add more quilting if you’d like. The game board is quilted. The Recess fabric really gets to show off on the board, doesn’t it? Now all that’s left is to quilt the game pieces with some more Recess fabric and make a traveling bag for them. One more day of sewing before we can play! Perfect for traveling with my grandchildren…I’m bored, I’m tired, there’s nothing to do….over and over again. They will love this! What a wonderful project. Will make a great gift.